We spend a lot of time on our organic lawn. Not only does the green grass provide a psychological respite to the dry, hot summer, but it also provides our home with forest fire protection. In other more urban areas experiencing drought conditions, many people are seeking alternatives to a living lawn, such as astroturf. Whatever your families choice for a lawn (or not to have a lawn), the safety of this play surface for your children should be a concern. Even schools use these chemicals, usually without warning to families. Luckily, kids below the 8th grade in Connecticut are now protected from pesticide applications on their school lawns. I wish California would follow suit, and I plan to take the issue to our local school board this Fall. Unlike chemical lawn treatments that are applied every several weeks, I apply organic fertilizer on my lawn just twice a year: Spring and Fall. I don’t want my children playing on a chemically treated lawn, and I don’t want the chemicals leaching into ground and surface water. Organic lawn fertilizers create a healthier lawn than chemical treatments, and with few applications, you save money by going organic. I have a friend that has an organic garden and eats only organically, yet she uses chemical products on her lawn. When I asked about her about this contradiction, her response was, “I don’t eat my lawn.” Even though you don’t eat your lawn, your animals or children might at times, and your mouth is not the only way chemicals enter your body. The skin is considered the largest organ because of its absorption abilities. A recent article in the Boston Globe explained that many backyards contain lead in the soil. Whether you are growing vegetables or a lawn in your yard, the presence of lead in the soil is a concern. The cause of such contamination could be flakes of leaded paint, the remnants of gasoline, or the residue from pesticide application of lead arsenate. Lead can remain the soil for hundreds of years. “If I had a garden in the urban environment I would just assume there is lead in the soil,” said Wendy Heiger-Bernays, associate professor of environmental health at the Boston University School of Public Health…Although soil around homes can contain everything from arsenic to motor oil, lead is one of the most common, and to children, one of the most dangerous: Even tiny amounts measured in blood levels can cause learning disabilities and behavioral problems. Most children who are lead poisoned are exposed from a variety of sources, with lead paint the most prominent, Heiger-Bernays said. But environmental and health authorities say vegetables grown in lead-contaminated soil also contribute to the problem. In adults, lead can cause or contribute to high blood pressure, reproductive problems, and memory loss. It’s pretty scary to think of all the chemicals and heavy metals that remain long after their use in our environment. When you think of the long term effects, future generations don’t have much hope for a safe environment to grow and play in. I would argue that any amount of lead is significant to children’s health! The last argument (that “any amount … is significant”) is simply wrong, and it undermines the entire argument. BTW, I manage my yard with an absolute minimum of chemicals, moving to full organic as we start gardening and planting fruit trees). The fact of the matter is that, while “purity” and “perfection” sound nice, it is actually the DOSE of any substance that matters, and the BALANCE of all of the necessary substances, not merely the presence or absence of particular substances. Below a certain level, any substance will have no effect, beneficial or harmful. E.g., taking too low a dose of medicine or vitamins will do you no good, and taking too low a dose of poison will do you no harm. Ever. Conversely, taking too much of anything will damage or hurt you. for example, simply drinking too much water will kill you, by throwing off the balance of electrolytes (mostly salts) in your system, imparing nervous systems nd muscle functioning. This is a real danger for endurance athletes, since the symptoms of over-hydration are sometimes mistaken for de-hydraion, causing them to drink even more. The dose of chemically pure water required to kill you is less than the dose of ordinary tap water. So, we need to focus on threats that ACTUALLY add EXCESSIVE dosages of toxins to our environments, in forms that our bodies will absorb, and stop getting riled up about theoretically impure things that don’t actually have any effect. That’s what drives me nuts about the various government oversight agencies right now. They’re trusting industry to do what’s right, rather than most profitable. I think we all know how well that works. As for me and lawns, ours looks terrible right now. We rent and the landlord’s lawn service doesn’t do anything about weeds, and the lawn was torn up by the plumber when the old pipes to the sewer rusted shut. Landlord knows and ignores the blank patches. If it were mine, I’d be hunting up native plants. My husband and I have decided that we only need enough lawn for the kids to play on when we get a place of our own, and the rest should be garden or native. Some simple steps to a better lawn. 1. Stop cutting it so short. 3″ + is good. 2. Get the dirt tested before putting anything on it. Why waste $$$ and time on stuff that won’t help the lawn. 3. Don’t cut so much. 4. Read, Read, Read, think. Great Article, there is not enough out there safe lawn care. Its important to be safe and read the instructions before applying anything. I agree completely with what some of said here. Minimizing chemicals is fine but it is about the dose more so then the composition. Sadly Organic does not mean good for the lawn either. 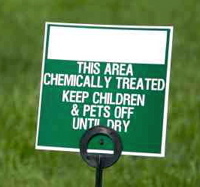 Spray arsenic on the lawn and I would wager it is not kid or pet safe at that point, but it is organic. When we do lawn service in Minneapolis we are very mindful about the dose, quality fertilization and supporting the lawns needs and the customers need for a healthy green lawn with minimal weeds.